How Fast Can I Finish a Bachelor’s Degree Online? The results are in, and it’s been confirmed—today’s American workforce is more educated than ever. Millennials are credited with contributing to the swelling number of workers in the United States who hold a bachelor’s degree or higher. And you may have noticed employers rewarding college graduates with higher starting salaries, pay increases, and management positions. If so, then you already know you need a bachelor’s degree to compete in a job market that increasingly opens its doors only to applicants who hold a four-year degree. But, with the demands of work and family, you may be thinking a bachelor’s degree will be too difficult to manage. You’re right about one thing—life won’t stop for you to go back to school. But there is a way to earn your degree while keeping your work and family commitments. Online bachelor’s degree programs offer the much-needed flexibility for people returning to college or those with an associate degree who want a competitive edge in the workplace. Many other working adults are succeeding in online programs—and so can you. It’s important, however, to figure out a plan for how to earn your degree as quickly as possible. After all, you don’t want to have to maintain this balancing act forever. Plus, the sooner you earn your bachelor’s degree, the quicker you can use your new skills to improve your career prospects. Here are seven tips to help you finish your bachelor’s degree as quickly as possible, and get a head start on your goals. Whether you’re going to school to obtain a better job in your field, start a new career, or earn more money, your reason for finishing your degree is what will keep you motivated when you feel stressed or overwhelmed. Inevitable late-night study sessions, evening work-related engagements, or family commitments can make you question if it’s worth it. During challenging times, it’ll be important to remember why you chose to finish your degree in the first place. There are hundreds of online degree programs to choose from, which can complicate your decision to return to school; too many options can promote inaction. There is a way to figure out the right program, however, but only if you’ve clearly defined your “why.” If you don’t know your “why”, then you may find yourself scrolling through numerous college catalogs only to find yourself overwhelmed and frustrated with the idea of going back to school altogether. Do you want to learn new skills, change jobs, or start a new career? Is your desire to complete your degree solely a “bucket list” item? The answers to these questions will lead you towards the best program and university for you and your goals. Flexibility: Does the program or university offer courses at times that do not conflict with your family time or work schedule? Location: Would you prefer to take some of the classes online and the rest on-site at the college or university? If so, will you have to move to attend university? Do you have the money to cover moving expenses? Unsure of how to narrow down your selection? Identify your areas of interest and present them to the admissions officer. They can help direct you toward a path that will help you meet your ultimate career goal. Use the admissions resources available at your prospective university to determine the best program to achieve your goals. If you want to complete an online bachelor’s degree fast, then you will need to be prepared to establish a routine that supports your efforts. Depending on the online course set-up (asynchronous or synchronous delivery), you may be able to determine precisely when you want to attend class. Asynchronous online delivery allows flexibility in accessing course materials via the internet. While not completely self-paced, student’s complete coursework at their own discretion as long as assignments and tests are completed according to the deadlines noted on the course syllabus. Communication mainly occurs via message boards and discussion groups. Synchronous online delivery requires you to login according to a predetermined schedule to access the virtual classroom. Instruction is offered in real-time and may incorporate instant messaging and videoconferencing as the main methods of communication. Online delivery can give you the flexibility you need to complete your degree. With it, however, comes the same responsibility of turning in assignments, projects and participating in an online environment. The ability to transfer the maximum allowable credits to your bachelor’s degree program will not only determine how fast you can finish but will also impact how much it will cost. If you started a degree program and stopped or have already earned your associate degree, those credits may be transferable. Look for schools that have articulation agreements with other colleges and universities. Northeastern University, for example, has agreements with over 20 community colleges in six states to support the seamless transfer of credits to one of their programs. Narrow down your list of prospective universities, then request a transfer credit guide or transfer equivalency database from your top picks. If the college or university does not have a written transfer credit guide, let your admissions representative know about the credits you’ve earned from other institutions to help determine how much of the program you will need to complete to earn your bachelor’s degree. Schools may also have a less formal review process which requires you to submit a copy of your transcript along with the course catalog from your prior institution. Transfer credit decisions can be made on a case-by-case basis. It may seem like a hassle to have to locate an old course description or syllabus, but it might be worth thousands of dollars in saved tuition. Colleges and universities have residency requirements to graduate from their institution. Residency means that a certain number of credits must be completed “in residence” under the direction/guidance of the faculty at the institution. 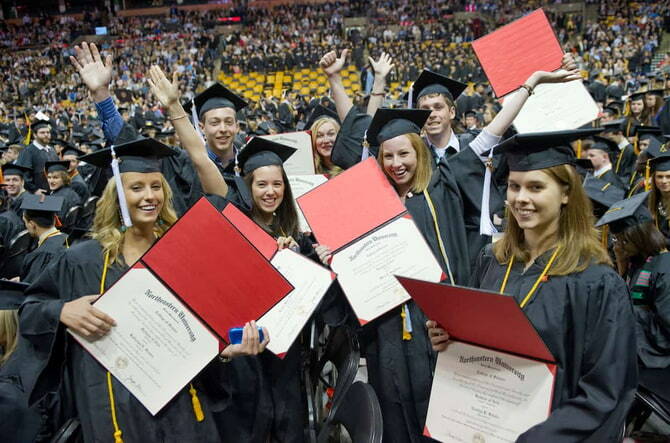 For example, Northeastern University’s transfer credit policy allows students to receive approximately 60 semester credit hours towards a bachelor’s degree program. The remaining coursework must be completed in a traditional classroom setting. Check with your prospective institution to confirm transfer credit limitations. Before enrollment, explore the possibility of demonstrating proficiency for what you already know. It’s possible to test out of introductory level coursework by passing challenge exams like Advanced Placement (AP) and College Level Examination Program (CLEP). There is a fee for each AP and CLEP exam you attempt, but if you test high enough on the exam, you will not need to take the course at college. Successfully passing a handful of challenge exams can significantly speed up the time it takes to complete your bachelor’s degree online while saving you money in the process. Additionally, acceptance of prior life experience for transfer credit may be available. Not all institutions offer this benefit; these credits are subject to the policies of the college or university you plan on attending. Northeastern University—Previously earned credit from colleges outside of the Northeastern College of Professional Studies can be applied toward a degree. Accredited Institutions—Students can transfer previously earned credits from a regionally accredited institution such as a community college. College Level Proficiency Exams—Exam scores can be treated as transfer credit at no fee. Assessment of Prior Learning (APL)—An APL review of a student’s work and life experience, including professional certifications, could translate into academic credit. Military—As a member of the Servicemembers Opportunity Colleges (SOC), Northeastern is committed to working with veterans and active duty servicemembers to accept any credits previously earned. Active servicemembers can transfer up to 75% of credits required for a bachelor’s degree. Many accredited colleges and universities do have limitations on the amount of credit you can transfer toward a degree program. Check with your prospective university to understand the scope of transfer benefits available to you. Every degree plan is based on a student completing a minimum number of courses per semester. Enroll in the minimum and add at least one more class to your schedule. If you can handle it, take extra courses in the summer. Maxing out the allowable credits per term will help you finish the program sooner—but only if you can manage the course load. An accelerated degree program is structured in a way that allows you to receive the same required coursework as a traditional program student but in a compressed format. For example, a 16-week semester course may be reduced to eight weeks. The content of the course is not reduced—just the time span over which the course is delivered. Accelerated online bachelor degree programs may allow students to earn a degree in as little as 18 months. Due to the intensity of this type of coursework, students should be prepared to allow more time, at least in the short term, for school. This option may work exceptionally well for students who lose focus under a traditional semester-based system. An accelerated program is intense and requires a significant daily and weekly time commitment. Such programs typically do not have summer breaks. Universities are offering more programs that meet the needs of non-tradtional students seeking to obtain their college degrees quickly. You can finish your degree by enrolling at a college or university that offers accelerated online degree programs. Prior college course credits and work experience can also help slash the amount of time it takes to complete your bachelor’s degree program of choice. Use the tips presented here, and you may have your bachelor’s degree before you know it. Tracy Scott is a content contributor for Northeastern's Lifelong Learning Network.